Don’t let the rustic exterior of the cottage fool you — the most common responses of guests when they first arrive at our cottage is ‘charming,’ ‘how cozy,’ and ‘how lovely.’ We are fairly simple in that we don’t have all of the frills of some other cottages (e.g., no hot tubs here! ), but, the cleanliness (one of our hallmarks), private wooded setting, and private beach area more than make up for what we don’t have. 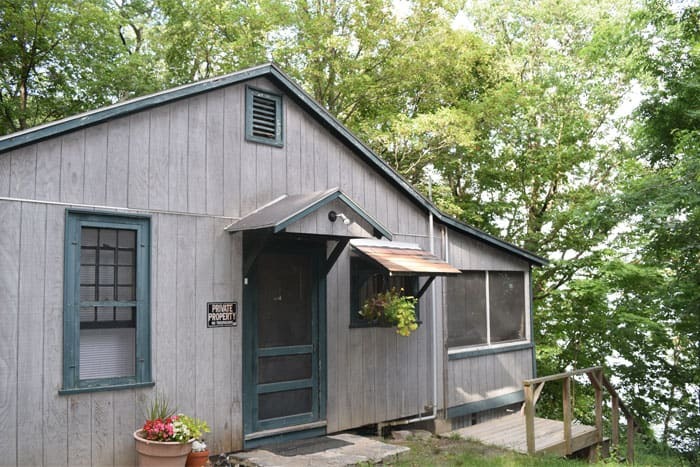 Overlook Cottage is divided into thirds which run parallel to the lake; the first third (closest to the lake) is a full-length, screened-in porch overlooking the lake, perfect for relaxing, rain or shine. (Its everybody’s favorite place to hang out!) 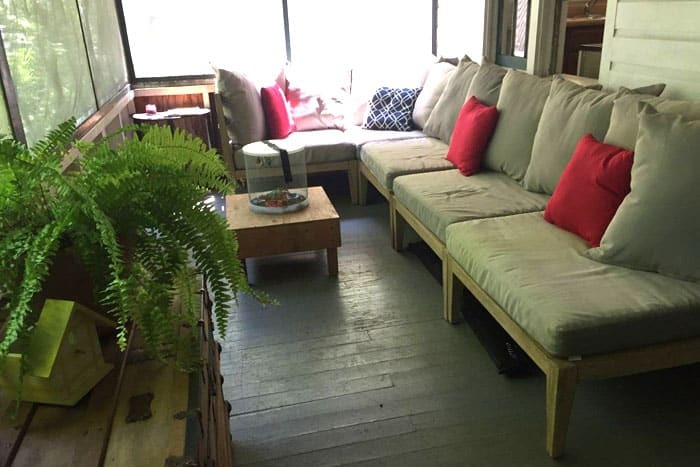 One side of the porch has a super comfortable sectional sofa perfect for napping and relaxing; the other side has a large table and plenty of chairs — just right for eating and playing cards or games (or-gasp-working on your computer!). 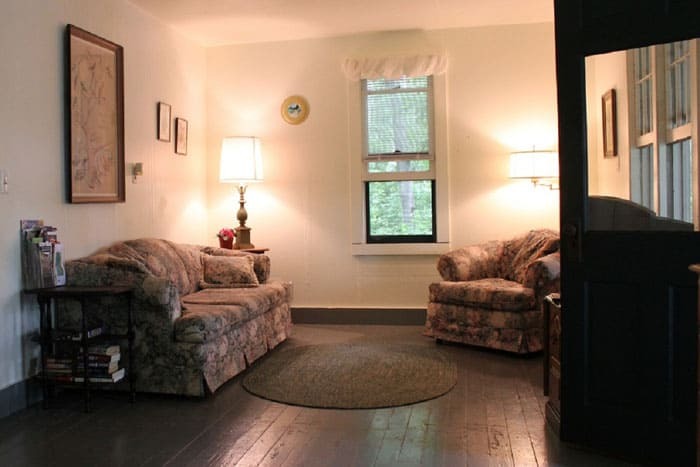 The middle third is a warm and inviting combined kitchen/living area with sofa and a large overstuffed chair, with large windows opening out to porch for views of lake from inside the cottage. 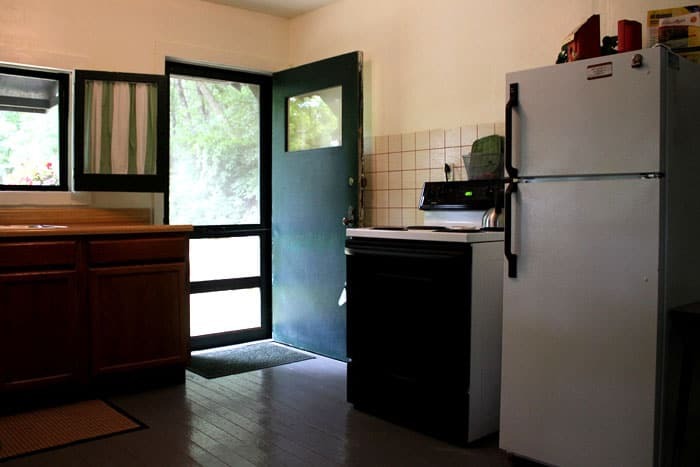 The kitchen area has the same large windows opening out onto the porch, and includes all of the appliances, utensils, and cookware you’ll need during your stay. 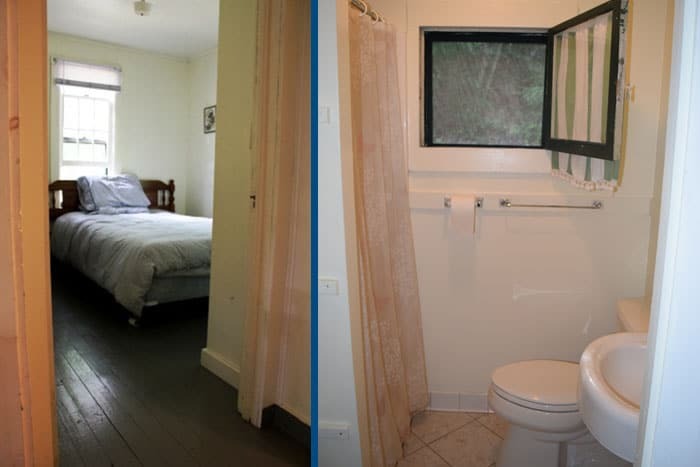 The back third of the cottage includes two small bedrooms, each with one double bed, dresser, and small nightstand, as well as a renovated bathroom complete with porcelain tile floor and shower. Overlook’s size makes it the perfect getaway/romantic retreat for two adults. Our most common renters are couples with or without one or two small children (note: we can accommodate a maximum of three adults, or two adults with two young children). 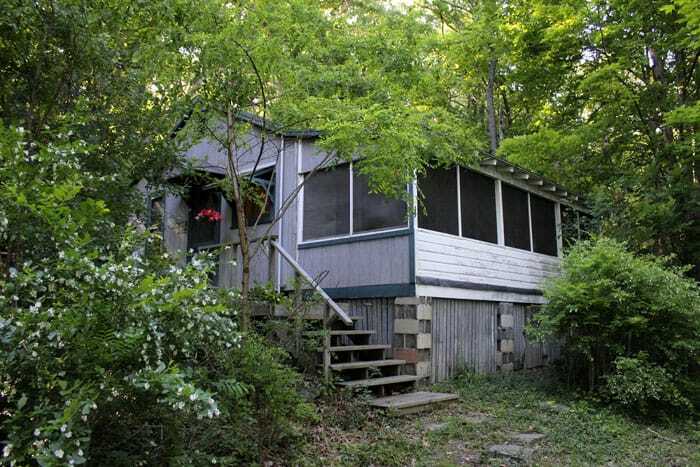 In fact, this is a perfect cottage and setting for children, as there are plenty of safe and secure woods, water, and outdoors for kids to explore, and the steps in between the cottage and the beach assure you that your child won’t wander off to the water. 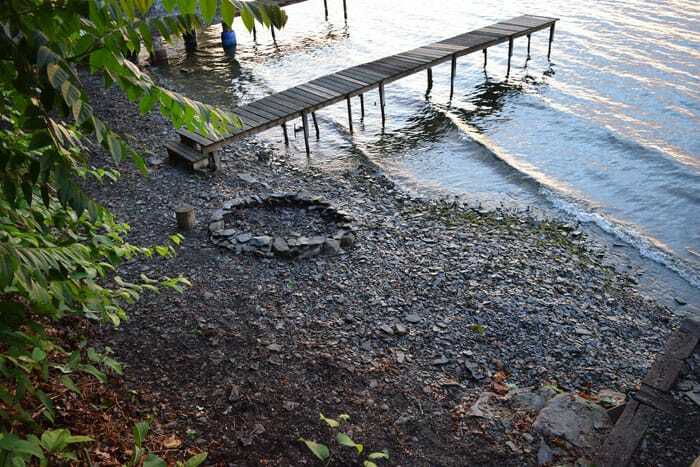 Children absolutely love the lake — so many rocks to skip! — and the gradually inclined beach make it easy for children to sit in the water at the lake’s edge, or walk out to where they feel comfortable. Too, the many types of wildlife at our property delight especially children, if they are lucky enough to see them — deer, newts, salamanders, ducks, great blue herons, red-tailed hawks, owls, ospreys, turkeys, eagles and many, many other birds are just some of the “critters” with whom we share the environment. If you’re visiting the regions wineries (and how can you not?! 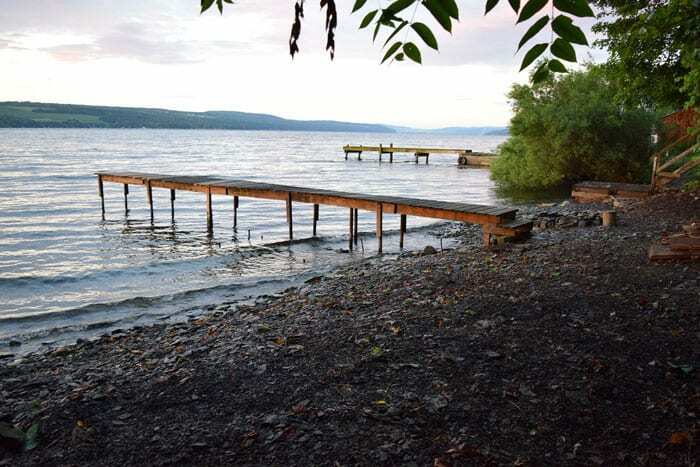 ), you’ll find that we are *perfectly* situated right in the middle of Seneca Lake Wine Country, with plenty of large and small wineries on both Seneca and Keuka Lakes within easy driving distance. In fact, you won’t find another location so close to so many great wineries! (And you can even easily walk to wineries that are nearby!) 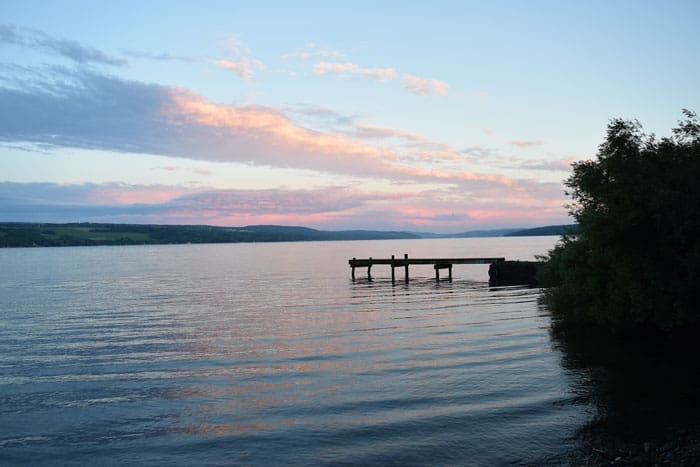 Our close proximity to Watkins Glen, Ithaca, Geneva, and Corning and their many activities is also great, making our cottage the perfect spot for your vacation getaway. If you’re coming for the fishing, we also offer parking for boat trailers. While you stay at our cottage, we do our best to provide any assistance and needs you may have (for example, we are always happy to transport kayaks that you might rent locally down to the waterfront for our guests, and help bring them back up). 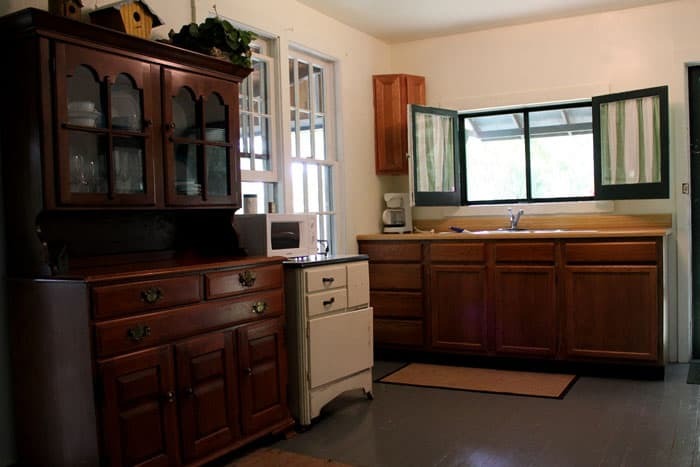 We offer you a personal touch, great location, and peace and quiet — the best value of any cottage, of that we’re sure! Please contact us for open dates and more information. 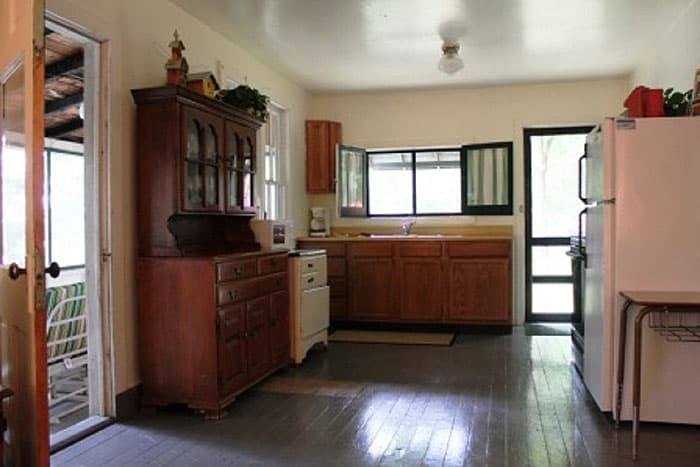 © 2019 Overlook Cottage - Finger Lakes NY Cottage Rental | Web site design by Julie Burgess Web Design.